After weeks of speculation, teaser videos, and XO Jane thinkpieces, "Oldchella"—the world&apos;s first modern festival solely focused on the 70-something rock star demographic—has finally been confirmed. 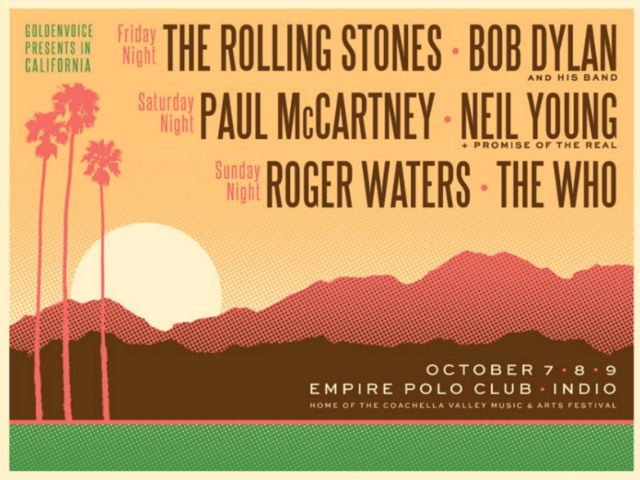 Goldenvoice, the organizers behind Coachella, has announced that Bob Dylan, the Rolling Stones, Paul McCartney, Neil Young, The Who & Roger Waters will play a three-day festival at the Empire Polo Grounds in Indio from October 7th to 9th. The fall festival (appropriately, it&apos;s filled with artists in the autumns of their careers) will be called Desert Trip, and not Oldchella, Oldstock, AARPchella, Oldapalooza, Bonnarock Music & Old Farts Festival, or any of the other slightly-snarky names we have been referring to it as with coworkers. Dylan and the Stones will play back-to-back on Friday October 7th; Young and McCartney will follow on Saturday October 8th, and The Who and Waters will close out the event on Sunday October 9th. As for tickets: single-day passes are $199 and three-day general admission are $399; reserved floor are $699, $999, $1,599; reserved grandstand are $999 & $1599; and standing pit are $1,599. Passes will go on sale Monday, May 9th. You can get all the information about purchasing tickets here. In all seriousness, this could be a once-in-a-lifetime chance to see a lot of seminal, long-in-the-tooth artists play together—from personal experience, we can attest that McCartney and Young still put on fantastic performances and shouldn&apos;t be missed. Meanwhile, The Who keep threatening to hang up the windmills forever, Dylan can only wheeze his way across minor league baseball stadiums for so much longer, and honestly, how many more world tours can The Stones pull off before Keith Richards decides to return to his home planet to live out the rest of his life? Our only complaint: we wish they had included even one female artist—if they wanted to keep it grounded in the &apos;60s, perhaps Jefferson Airplane or Joan Baez could have fit the bill. Considering that they were willing to include Roger Waters (who didn&apos;t take the reins of Pink Floyd until the 1970s), they could have even dipped into the &apos;70s catalogue to pull out Fleetwood Mac, Emmylou Harris, or even a DJ set from Yoko Ono.